Moncada in between Vane (left) en Professor Wijnen, rector magnificus. Sir John Vane has devoted his life to battling the disease enemy with new pharmaceutical weapons, with new biochemical intelligence and with new alliances among disparate human communities in big pharma, academia and self-help groups. In 1982, his efforts were recognized with a Nobel Prize and since that time he has re-doubled his efforts to fight disease, with a special focus on curing pulmonary hypertension. 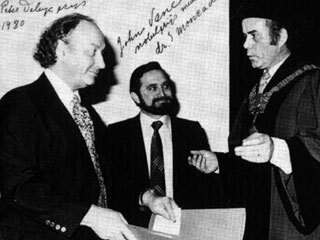 Sir John Vane graduated in Chemistry, took a D.Phil. in Pharmacology and received the Nobel Prize in Medicine for his work on prostaglandins and for the discovery of the mechanism of action of aspirin. He spent 20 years in academic research. In 1971, Vane and his colleagues discovered that aspirin and similar drugs produced their effects because they inhibited the biosynthesis of a group of lipid mediators called prostaglandins. In the last five years it has become clear that there are two enzymes involved. One of the ‘cyclo-oxygenases’ called Cox 1 is responsible for making prostaglandins, which protect the stomach and kidney from damage. Inhibition of Cox 1 accounts for the unwanted side effects of aspirin-like drugs such as gastric irritation and renal damage. The other enzyme, Cox 2, is induced by inflammatory stimuli and it is prostaglandins made by this enzyme that contribute to the inflammation in diseases such as rheumatoid arthritis. The presently marketed aspirin-like drug inhibits both enzymes and the research may lead to selective inhibition of Cox 2, the enzyme responsible for inflammation.